Pastor Gary has lived on Robinson Street since 1995. He and his family moved there so that they could be active members of Friendship Community Church and good neighbors in the West Oakland community. Later, when Gary felt called to the ministry, he entered Pittsburgh Theological Seminary and graduated in 2004. He pastored two rural Presbyterian churches in Ohio for two years, making the 60 mile commute several times a week. Each time he came home to Robinson Street, his heart longed to be in full-time ministry in his own neighborhood. Born in Texas to a young couple preparing to be missionaries—a teacher and a printer—Gary then spent most of his childhood in Burundi, a small country in East Africa. He went to high school at Rift Valley Academy, a missionary boarding school near Nairobi, Kenya. He used to love reading novels, biking on dirt roads, and, most of all, playing soccer with his Barundi friends. At Rift Valley Academy he played on the rugby and soccer teams. He could also be found over a good game of cards (Rook), in a ping pong match, or at a practice of the concert choir. Gary came to the U.S. to attend college, and graduated from Asbury College (Lexington, KY) in 1980 with a degree in English. He continued his studies at the University of Kentucky (M.A.) and Indiana University (Ph.D.), and then later came to Pittsburgh to teach English at Carnegie Mellon University. Gary met Laurel at Asbury College, and they were married in 1982. 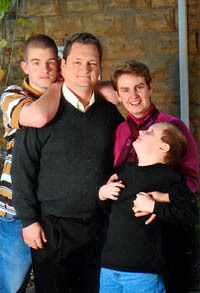 Laurel had grown up as a pastor’s daughter in Ontario, Canada. They gave birth to a son, Alan, in 1990, and moved to Lille, France for two years where Laurel worked on her doctorate in French. Their second son, Brian, was born in Pittsburgh in 1998. I encourage you to contact me as your pastor. I want to be here for you, and your friends and acquaintances. Remember, my calling as your pastor is a road we must explore together.